A few weeks ago, I took my camera up on Mt. Adams in Cincinnati, Ohio. I wanted to get some general skyline views of the city but I also wanted to get a couple of unique shots. This night the Reds were playing and the ballpark was all lit up. So this added a bit of interest to the skyline. This is my slow shutter tripod shot. I set the shutter on thirty seconds. I was hoping to get a better car blur in the streets but I think there was too much other light to offset that. This shot was also a normal shutter. Post shot I put a filter on the picture to make it look like everything was glowing. I thought this would better tell the story as it seemed these two were enjoying a scene together. I placed the camera on a rock border for this shot. I wanted to get a unique view of the skyline. A plant’s view of the city. This is looking down from the hill. The grass on the side of Mt Adams, also has a nice view. In this shot, I put the camera on auto. It chose a much faster shutter than the first shot. This was also on a tripod. To view more of my photos, please visit my galleries. Thank you. Night shots are very hard for me. Existing light photography is very hard. I can’t tell you how much slide film I burned through in the 80s trying to get the night shots of Pittsburgh that I wanted. You’ve done a very good job. I agree. I can’t imagine trying to get this on film. With digital it’s easier to take many shots until you get the ones that you want. Do you have any of your Pitt shots at night online? I would be interested in seeing them. Thanks. I really like the sun through the snowy tree and the snowy train track photos. ” a plants view of the city”….aw how cute! Nice shots. Your blog is reminding me how important one’s character and creativity is to everything in ALL situations…that outside of the box thinking really will take your photography off the charts. Keep it up! Thank you for your comments. I hope you are right. What filter did you use in post to get that interesting glow? I do very much like the effect. It’s a post shot filter called Glow on FX Photo Studio. Thank you. I am still trying to learn about soccer, umm.. I mean football. Your website will help. haha oh no problem, what is it you want to learn exactly? Too much to put here. Thanks for your comments. I am sure I’ll have questions about soccer on your blog. Thanks for visiting my blog. 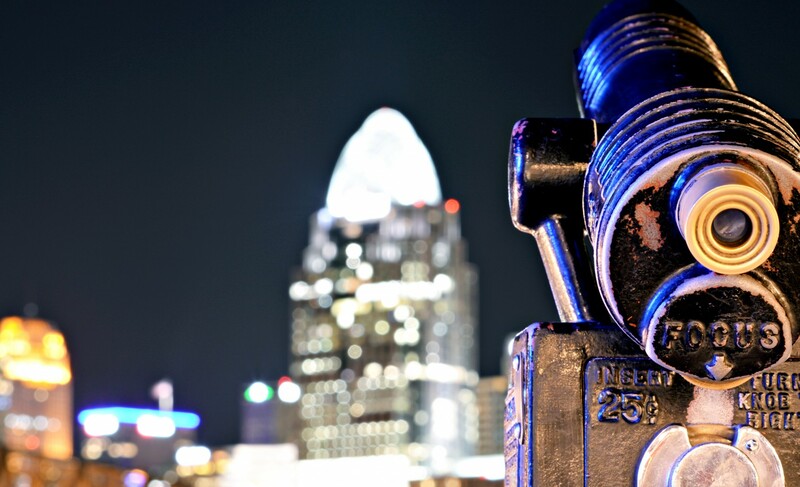 I love the Cincinnati photos; it’s where I grew up and I blog about it from time to time. You are welcome. It’s a nice area. Thank you. What were you doing in these parts? I’m from Maryland but go to school at Ohio University. Visited my cousin in Cincinnati a couple weeks ago and went to Mt. Adams. It was so cool! Loved this post. Thanks. So how is OU for photographing? Haven’t been down there before. Oh it’s really nice, all red brick and trees and small town charm. Plus, Hocking Hills is like ten minutes away and it’s really beautiful, perfect place to take pictures. Your photography is magical ! Thank! I enjoy shooting and I am glad someone enjoys what I shoot! Thanks again. Thanks. I have to say, it is my favorite of the bunch. The light trails are just amazing…. Looks really excellent. I’d like to get more experience of taking shots at night, but have never really mastered it – at least not yet. It’s hard. You must have a tripod and the right shutter setting. yeah, that was partly what went wrong…long shutter speed/blurred picture. Some really inspiring shots! As a huge Reds fan, absolutely love the photo with Great american ball park! Thanks Kurren. Nice blog you have. I am now following. I always struggling with night shots, maybe I’ll set myself a Christmas lights challenge…! Enjoyed the city shots. Great shots; love your work! Hey- thanks for checking out my blog! Cool pics- I am in love with Cleveland and am constantly inspired by the architecture, nature and people in my beautiful and gritty city! Thanks Jessica! Cleveland is a nice city.